We have many events that provide the funds to support art in our community. Whether it be through donations to local area Art Teachers, Scholarships for graduating High School students or simply volunteering to beautify our community, our members work tirelessly to make a difference in Indian River County, Florida. Volunteer members of the Vero Beach Art Club have painted several murals, and painted a bench that was auctioned off to benefit Hibiscus House. The Cultural Council of Indian River supports Art in Public Places. CLICK HERE for the Cultural Council web page highlighting Art in Public Places. Each year our Art Club members participate in the Festival of Trees by creating ornaments with a theme, and decorating a tree that will be auctioned off to benefit the Children's Riverside Theatre. Members create unique ornaments to fit our theme. It is always a challenge for our artists to come up with unique designs and bring the tree together to present at the community event. Each year the Vero Beach Art Club offers scholarships to graduating seniors who have been accepted into an accredited higher learning institution to study art. We have awarded scholarships for many years and love supporting our talented youth in their quest for higher learning. See our Scholarships page form the link below for details. 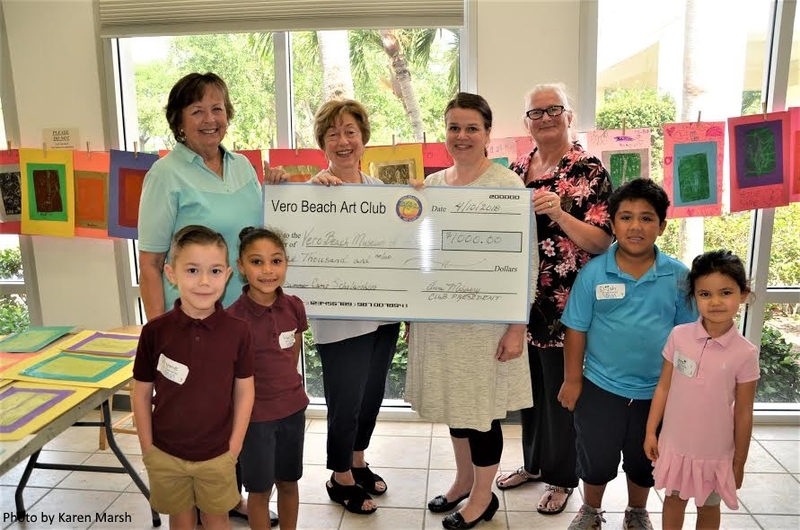 The Vero Beach Art Club makes donations to the Vero Beach Museum of Art for their Camp Scholarships, local area schools for art teachers/supplies, and the Recreation Department for art supplies for summer programs.